The first part presents a conceptual model of the economic system in its ecological and social context. It is developed via an integration of basic concepts in physical resource theory, animal and human physiology, economic theory and systems ecology. The capacity of the model to support analysis of such complex systems where life is a key system characteristic is high. The conceptual model shows the dependency of the human economy on support by non-renewable and renewable resources from Nature (i.e. ecological source restrictions), as well as the capacity of ecosystems to assimilate wastes (ecological sink restrictions). The analysis focuses general principles; thus, the high level of abstraction results in an apparent simplicity. In the second part, we integrate traditional economic production functions and the conceptual model, which results in the formulation of a biophysically anchored production function (BAPF). The BAPF by itself, and through the system of ecological economic accounts that can be derived from it, represent a toolbox that supports the operationalisation of a sustainable development from micro to macro level. It is coherent with Impredicative Loop Analysis, existing management systems within agricultural sciences, OECD’s principles for sustainable development and the approach of Millennium Ecosystem Assessment. 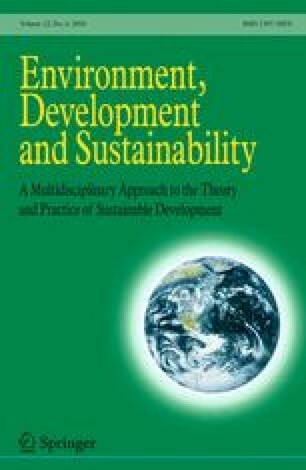 Compared to analytical approaches used in the formulation of sustainability policies in the private and public sphere, based on conceptual models ignoring the complexity when life (bios) is a defining system characteristic, its relevance for the operationalisation of sustainable development approaches infinity. The third part presents results from statistical analysis of relations between gross domestic product and energy supply and some emissions, respectively, for different nations and time periods, delivering values on levels and trends for parameters in the BAPF as well as a first test of the relevance of the BAPF proposed. The paper is ended by a theoretical analysis of the costs of provoking an economic system working under ecological source and sink restrictions to follow exponential growth: The need to decouple economic growth from natural resource use and emissions is highlighted. Otherwise, the erosion of the ecological foundation of the economy with regard to source as well as sink aspects will be a function of exponential growth. Sten Ebbersten, Knut Per Hasund, AnnMari Jansson, and reviewer #1 provided valuable comments on earlier versions. The work was partly funded by Ekhagastiftelsen. ASPO. (2009). http://www.peakoil.net/. Accessed 6 Feb 2009. Lagerberg Fogelberg, C. (2008). På väg mot miljöanpassade kostråd—Vetenskapligt underlag inför miljökonsekvensanalysen av Livsmedelsverkets kostråd, Rapport 9 2008, Livsmedelsverket. http://www.slv.se/upload/dokument/rapporter/mat_naring/2008_livsmedelsverket_9_miljoanpassade_kostrad.pdf. Accessed 02 Nov 2009. MAX. (2009). Metod (för klimatanalys bakom MAX’ klimatstrategi). http://www.max.se/download/Metod%20Max%20klimat%20080506.pdf. Accessed 2009. MEA. (2009). http://www.millenniumassessment.org/en/About.aspx. Accessed 6 Feb 2009. OECD. (2001). Policies to enhance sustainable development. Meeting of the OECD council at ministerial level, 2001. http://www.oecd.org/dataoecd/47/22/1869800.pdf. Accessed 29 Mar 2008. SBA. (2008). Minska jordbrukets klimatpåverkan! Del 1. Introduktion och några åtgärder/styrmedel (“Reduce the climate impact of agriculture! Part 1. Introduction and some measures/incentives”) (in Swedish) see http://www2.sjv.se/download/18.677019f111ab5ecc5be80007018/klimat_delrapport_1.pdf. Accessed 25 Aug 2008. SNFA. (2008). http://www.slv.se/templates/SLV_NewsPage.aspx?id=21729&epslanguage=SV. Accessed 25 Aug 2008. Statistics Sweden. (2009). The system of environmental and economic accounts, see http://www.scb.se/Pages/Product____38161.aspx. Accessed 02 Sep 2009. Swedish National Institute of Economic Research. (2002). Living-cost index 1841–2000. At www.konj.se/statistik/Data/Inflation.xls. Accessed 21 Aug 2003. UN. (2008). UN millennium goals. http://www.un.org/millenniumgoals/poverty.shtml. Accessed 25 Aug 2008. UN. (2009). UN committee of experts on environmental—economic accounting. http://unstats.un.org/unsd/envaccounting/ceea/. Accessed 7 Feb 2009.